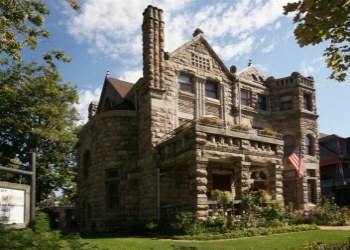 The Historic Raymond House is the home to Denver's premier Bed and Breakfast Inn, The Castle Marne. Built in 1889 as the first home in the newly forming neighborhoods of Denver away from downtown. The Rhyolite stone building was built by famed architect William Lang, creating Denver's own European style Stone Castle which put Denver on the map. Listed in the Dupont Registry of American Castles sets this building apart from anything else in the city and Colorado. Still using many of the same amenities of the 1900's, such as original hot water radiator heat, an original bathroom featured in one of the 9 rooms, and then augmented with modern day luxuries such as in-room Jacuzzi tubs, and the city's only outdoor hot tubs for two on private balconies. The three rooms with private hottubs make the Castle Marne, Denver's most luxurious and recognized iconic stone buildings open to the general public as the most welcoming B&B inn. At the corner of 16th and Race on Denver's Capitol Hill, this famous old mansion is celebrating its 123rd year, lovingly restored to its original splendor. The rusticated lava stone house was built in 1889, amidst the greatest construction boom in Denver's history. The architect was William Lang, the most eclectic architect of the time and creator of the Unsinkable Molly Brown House. The architectural style is Richardsonian Romanesque with Queen Anne overtones. Lang designed over 300 homes in Denver, but fewer than 100 are left standing today. Financially ruined by the Silver Panic of 1893, the illustrious architect died tragically, a penniless pauper, in 1897. The exterior construction is native lava stone, known as Castle Rock Rhyolite quarried in Castle Rock, Colorado. Composed mainly of quartz, mica, and feldspar, it sparkles and glitters. The walls are 22 inches thick. The exterior is lavished with elaborate displays of carved stonework. You will notice the eclectic massing and detailing, the heavily rusticated stonework juxtaposed with the refined, delicate elements of glass and fenestration. The entry Foyer woodwork and Parlor Fireplace mantel are especially noteworthy. Notice the pagan carving of the Green Man in the mantle. The first floor ceilings and frieze are unique. Known over the years as the Raymond House and/or The Marne, the landmark structure has patiently endured years of treatment "varying from weepyeyed love to flinty entrepreneurial stewardship"
In the spring of 1989, with the renovation of the Castle Marne in full swing, four construction workers were relaxing in the sun during their lunch break in the front yard. The large front door was standing open, offering a view through the foyer, up the main staircase. They were amazed to see a beautiful young girl dressed in her finest turn-of the century party attire coming down the staircase of the empty house. She stopped to admire herself in the mantel mirror, then skipped down the front porch stairs, swirling past the stunned workers. They watched dumbstruck as she got into a horse-drawn carriage that was waiting for her at the curb. The construction workers turned to look at each other with astonishment, and then back to the curb. The carriage and the little girl had disappeared into thin air. Could she be the same little girl whom guests have said knocks lightly on their door late at night, then enters through the door itself, disappearing into a mist?